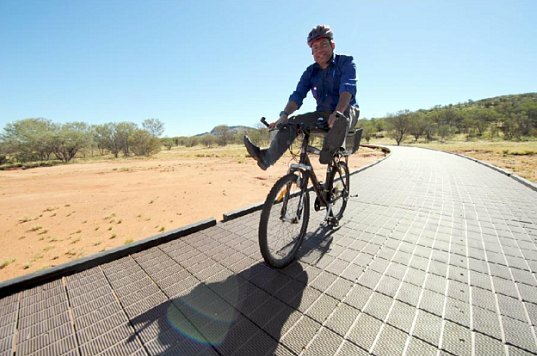 Australia's Northern Territory Parks and Wildlife Minister Karl Hampton tests the new bike path. Photo via The Centralian Advocate. The next time your printer cartridge runs out of ink at just the wrong moment, remember this story – and recycle it. A new bike path made with Replas recycled plastics – mostly recycled printer cartridges – opened recently in Central Australia, stretching 17 kilometers and linking Alice Springs with Simpsons Gap in West MacDonnell National Park. Upgrades include a bridge made entirely of recycled plastic, which is durable, low-cost and environmentally friendly. Northern Territory Parks and Wildlife Minister Karl Hampton said the new path was part of an effort to protect the environment and also provide a unique experience for the park’s 120,000 annual visitors. Also Down Under, in July 2008 recycled plastic was used for the final 90 meters of the Magnetic Island boardwalk in Australia’s Great Barrier Reef region. In Catalonia, Spain, the ZEBRA – a bike lane divider made of recycled plastic PVC coating of electric cables – won the Catalan 2009 Award of Design for Recycling. And recycled plastic bikes are on their way, as well. Perhaps the most impressive of all is the recycled plastic railroad bridge. In March of this year, Axion International Holdings, Inc. installed the first two such bridges in Fort Eustis, Virginia. In this case, the plastic came mostly from milk jugs and car bumpers. Each bridge supports a load of 130 tons (260,000 pounds). And again, the bridges are not only environmentally friendly but also cost less to build than their steel, concrete or wooden counterparts. Any other examples of the recycled plastic transportation revolution? 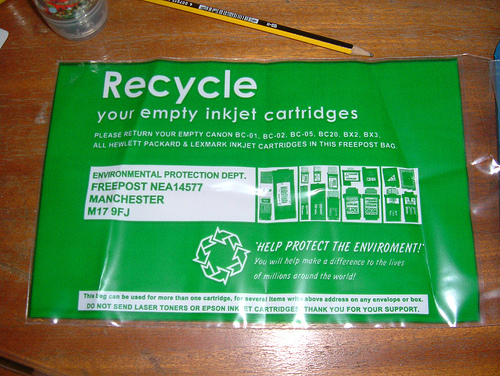 You may get frustrated with your printer cartridge, but don't trash it! Image via Jon Newman.